All structures of the eye are susceptible to the harmful effects of diabetes. Diabetic individuals are more prone to visual disability than non-diabetic individuals. Diabetes-related eye disease has a strong relationship to the control of blood sugar and duration of diabetes. Uncontrolled diabetes may lead to various eye problems affecting the lids, cornea, muscles, lens, retina and the nerves. Individuals with diabetes are generally prone to acute infections of any kind especially when there is uncontrolled diabetes. The eyelids are more susceptible to infection and, hence, ulcerative blepharitis and styes are more commonly found in diabetes patients. Blepharitis, chronic inflammation of the eyelids, is one of the primary causes for eye discomfort. Symptoms of blepharitis include: burning, itching, light sensitivity, and sandy, gritty sensation that is worse upon awakening. 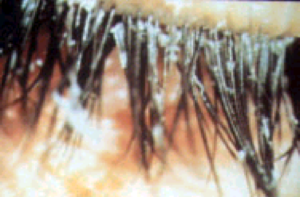 In severe cases, redness and stickiness of the eyelashes with discharge as shown in the photograph may be present. Good control of diabetes with simultaneous treatment of blepharitis will bring about a quick recovery. Recurrent occurrence of small boils known as styes may be observed in the lids characterised by pain along the lid margin, which is followed by a swelling. Recurrent styes are sometimes the first indications of diabetes and hence should prompt the individual to undergo blood tests. On control of blood sugar and with suitable antibiotics for the stye, the condition regresses. Another condition called as chalazion manifests as small swelling inside the lids. This condition is painless unlike the stye, however, may get infected and painful if diabetes is persistently in the higher levels. Redness of the eyes accompanied by discharge and stickiness of eyelids called conjunctivitis is also common in diabetes. In addition, among diabetic individuals, tear secretion can decrease as duration of diabetes increases, which causes burning, stinging and discomfort. This can result in drying of the eyes and predispose them to infection of the outer colourless portion of the eye called ‘cornea’. sudden with the patient experiencing discomfort in the eye and double vision. Nerve palsies due to diabetes recover completely if blood sugar is normalized. However, the recovery period may vary from 3-6 months. As diabetes can affect the nerves connecting the outer surface of the eye, diabetes patients can have decreased sensation in the eye, which may predispose them to weakness of the cornea. This decrease in sensation may predispose them to bacterial corneal ulcers and difficulties with contact lenses. Indeed, diabetic patients who wear contact lenses must take extra care with lens hygiene and keeping the cornea moist and should seek advice early if any problem like irritation, blurring or redness develops. Iris is the coloured portion of the eye and it controls the opening called as the ‘pupil’. The iris is like a diaphragm and it contracts and relaxes and determines the amount of light that enters the eye. In some diabetic individuals with long duration of diabetes it is difficult to dilate the pupils with drops to examine the inner portion of the eye. This condition is called as ‘autonomic neuropathy’ and in this condition, the patient may require more time and medication (drops) for dilatation. Pupillary dilation in diabetic patients is especially important for detection and appropriate treatment of the diabetic changes in the retina. As a late diabetic complication, a condition known as rubeosis iridis, a reddish discoloration in the colored part of the eye (iris) due to the growth of abnormal vessels may be seen. This condition may progress to neovascular glaucoma, where these new vessels block the angles of the eye and cause an increase in the eye pressure. The vessels may also bleed into the eye. The lens in the eye undergoes the formation of cataracts, alterations to its curvature and refractive index of the lens which result in power changes in the eye. Cataract – the clouding of the lens, may manifest with symptoms of glare and increased light sensitivity. Senile cataract which occurs in young Type 2 (non-insulin dependent) diabetic individuals is more prevalent and occurs more advanced in one eye and matures slowly. 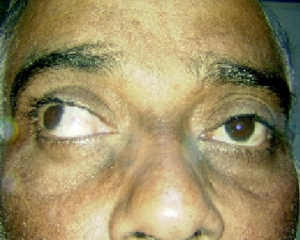 However, true diabetic cataract that occurs in Type 1 (insulin-dependent) diabetes in both the eyes (bilateral), consist of bands of white subscapular dots and fine needle-shaped opacities. It is also known as snowflake cataract due to its appearance, however, it rarely affects vision. Fluctuating myopia (near-sightedness) can be a presenting sign in diabetes. High blood sugar causes the lens to swell and change its refractive power leading to blurring of sight. Hence, testing for new spectacles should not be done until the blood glucose has stabilized. Optic neuritis is a condition where the optic nerve is infected following endogenous or local infections like sinusitis especially in subjects with diabetes. The symptoms include slowly progressive loss of vision, colours appearing “washed out” with loss of contrast sensitivity, discomfort and pain in and around the eye often worsened by movement of the eye and swelling of the optic disc. Vision usually improves in about 85% of patients after a few weeks or even months, however, it may not return to normal. In addition to control of diabetes, antibiotics for control of infection and steroid injections may be necessary to help the optic nerve recover. Optic disc swelling (diabetic papillopathy) is usually seen in Juvenile Type 1 diabetes patients in 2nd and 3rd decade of life. Papillopathy is often bilateral and usually causes no symptoms. Loss of vision in this condition is usually moderate, however, it tends to recover in 6 months. A person with diabetes is nearly twice as likely to get glaucoma compared to non-diabetic adults. Glaucoma causes slow and progressive damage to the optic nerve, which is the connection between the retina and brain. It rarely causes symptoms. Detection and prevention are only possible with routine eye examinations. However, certain types, such as angle closure and congenital, do cause symptoms like sudden decrease of vision, severe eye pain, headache, glare and light sensitivity. Glaucoma is detectable by routine tests like computerised field testing and actual measurement of optic nerve and retinal fibre measurement by Optical Coherence Tomography (OCT). The retinal complications due to diabetes include diabetic retinopathy and retinal vein occlusion. Diabetic retinopathy, affects the inner layer of the eye (the retina) due to diabetes is today the major cause of visual impairment. It can be basically divided into two types – non-proliferative and proliferative. One in five diabetic individuals may develop diabetic retinopathy according to the CURES Eye study (17.6%) conducted by us. The two sight-threatening forms of diabetic retinopathy are Diabetic Macular Edema (fluid accumulates in the macula) and Proliferative Diabetic Retinopathy (‘new vessels’ formation/bleeding in the retina). As individuals with sight threatening retinopathy may not have any symptoms, life-long dilated retinal screening is a valuable and necessary strategy for early detection of diabetic retinopathy. Retinal vein occlusion is one of the common retinal vascular diseases responsible for visual loss in diabetic individuals, which can vary from mild or severe. A retinal vein occlusion is a blockage of veins in the retina that drain blood out of the retina, back to the heart. Patient may complain of sudden painless loss of vision and may complain of a sudden onset of floating spots or flashing lights. Thus, as eye complications in diabetes affecting all structures of the eye, routine, yearly, expert clinical examination is mandatory for the fundamental ophthalmic care of the patient with diabetes. In addition, timely treatment (laser photocoagulation) and good control of diabetes, blood pressure and lipid levels are essential.